Ministers have announced a new £48m cash pot to help councils and bus companies put more environmentally-friendly buses on the roads. Local authorities and operators in England and Wales will need to bid for a share of the Ultra-Low Emission Bus Scheme, which the Department for Transport (DfT) said would pay for hundreds of new ultra-low emission buses as well as the infrastructure to support them. Officials said the DfT’s forthcoming strategy on the pathway to zero emissions road transport will discuss how the transport sector is going to have to change dramatically to cut down on harmful emissions. The UK will host a Zero Emission Vehicle Summit in the Autumn. Transport minister Nusrat Ghani said: ‘We are doing more than ever before to reduce greenhouse gas pollution across all modes of transport and we are committed to ensuring nearly all cars and vans are emissions-free at their tailpipes by 2050. ‘In order to achieve this ambitious target, the transport sector is going to have to change dramatically over the next couple of decades – and buses are no exception. The DfT said the new scheme follows the success of the previous Low Emission Bus Scheme, which saw 13 organisations receiving more than £30m between them. The cash is part of a wider £100m scheme announced in November 2016 to support low-emission buses. 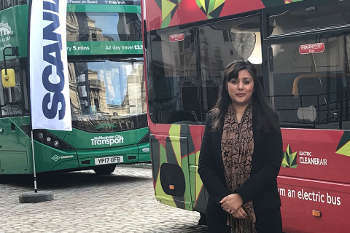 In February at the UK Bus Summit, Ms Ghani announced that 20 English authorities had been awarded £40m from the Clean Bus Technology Fund to retrofit older buses to meet emissions standards.